The Web names marketplace lost more money than expected in the third quarter, sending shares way down. Did GoDaddy deserve that whipping? What: Shares of Web domain names vendor GoDaddy (NYSE:GDDY) fell 11.8% in August, according to data from S&P Capital IQ. By the end of the month, the young stock had retreated 24% from the highs it set in June, trading 4% below its early April market debut. So what: In early August, GoDaddy posted its second quarterly report as a public company. Analysts expected a net loss of approximately $0.17 per share on something like $393 million in top-line sales. The company exceeded the revenue consensus thanks to a $395 million performance, but fell short where it matters, with a $0.46 net loss per share. The next day, GoDaddy's shares closed 11% lower. Now what: The stock recovered slightly later in the month, when Business Insider published a weekender interview with GoDaddy CEO Blake Irving. That article portrayed Irving's company as an innovative upstart, still hungry enough after 18 years in business to try unconventional sales tactics and employee motivation ideas. But that bounce was small and quickly faded into the market's background noise. 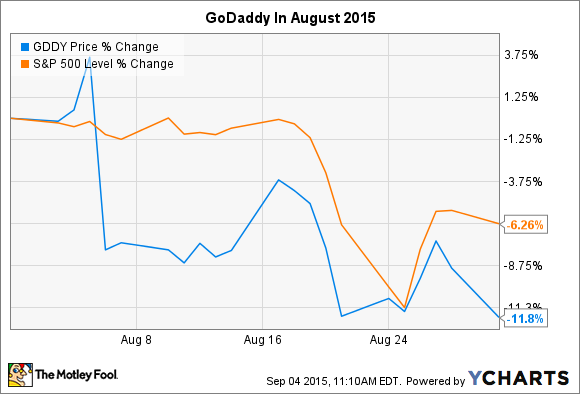 In the end, it was the earnings report that set the tone for GoDaddy investors in August. On the upside, much of that surprisingly large loss came from $21.4 million in early debt extinguishment fees, as the company used IPO funds to lighten its balance sheet. A $300 million payment reduced GoDaddy's long-term debt load to $1.05 billion. Without that financial fee, GoDaddy would have reported a net loss of approximately $0.13 per share. But it's not clear whether analysts had been counting on that unique line item, so it probably isn't fair to compare that lower loss to Wall Street's projections. In spite of the negative bottom-line figures, GoDaddy is clearly doing many things right. The company's unique marketing approach seems to appeal to the target market of owners of very, very small businesses. Adjusted EBITDA profits rose 29% year over year to $82 million, lifted by a 16% increase in order bookings and 17% higher collected revenues. Tellingly, six of the 10 Wall Street firms that offer earnings estimates for this stock have increased their third-quarter projections since that fateful second-quarter report.